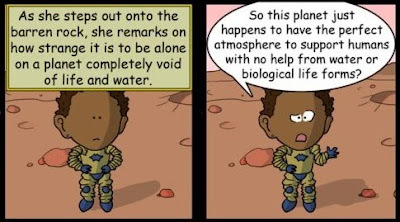 The latest episode of science-loving web comic The Stonemaker Argument features a little girl after my own heart. Go read the whole comic! Cute -- and the strip gets extra marks for the details of its protagonist. However, there's a fine line dividing accuracy from pendantry, especially when dealing with hypothetical technologies (warp drives, to give one example). In science fiction, as in all literature, plots and characters come first. Stories are gedanken experiments, not manuals. Yeah, if you can't suspend disbelief just a bit you'll have a hard time enjoying SF, because pretty much every non-mundane SF story has some sort of fantastic element to it. Warp drives and other means of FTL travel aren't very "realistic", but often necessary for the story. I'm less forgiving of scientific problems that seem more a lapse of the imagination necessary to work within the constraints of the physical universe than a creative choice. Agree with both the comments above thanks for sharing..!